I’ve been reminded by my faithful readers–okay, by one faithful reader–that I left you my reader(s) cruelly hanging on the continuing story of Babes and her little family. I apologize, and I will fill you in at this time. Are you ready? I believe I left you with two fluffy chicks–Puff and Silk–being cared for successfully by their doting mama Babes, and one pipped, cooled egg whisked into the incubator in the house. You can clearly see the “pipped” area on this egg, where the chick has pecked through. It takes colossal self-control for me to not just rip off that shell at this point in the process. Usually an egg will hatch within a few hours of its being pipped. We knew that the chick had pecked through that morning, so by suppertime we started to feel worried for him. He was still peeping, but his peeps were getting fewer, and weaker. Malachi, Amalia and I had already invested enormous amounts of bonding energy into this chick. We loved him as if he were our very own. Well, he was. We weren’t going to let him perish. 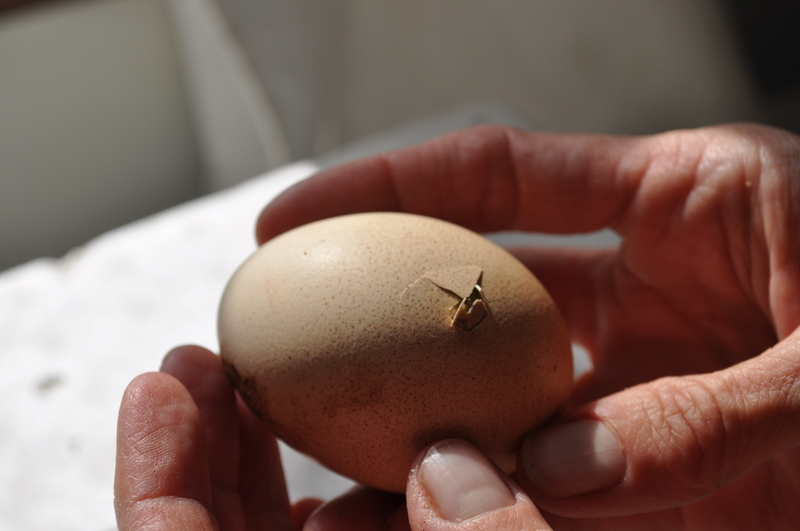 There’s quite a controversy over the issue of helping a chick hatch out of an egg. I searched online for articles about it. The prevailing opinion seems to be: NEVER, NEVER DO IT, UNDER ANY CIRCUMSTANCE, or THE CHICK WILL DIE AND (quite possibly) SO WILL YOU. The main reason for this seems to be that if the chick is not strong enough to get out of the egg, it probably has something wrong with it and you may have to cull it, anyway. (Culling a chick is not something that I, personally, can do.) Another reason: you can actually kill the chick you are trying to help. So, article after article insisted that one must never assist a weakening (and possibly) dying chick out of its prison-like egg, no matter what. That just didn’t set right with us, however. I’m not one to automatically believe three hundred articles, even if they all say the same thing. They might all be wrong, for example. I could bring up historical examples, but I know you’re just hoping that I’ll get back to the story. So I shall. I am a slave to my reader(s). To wit: Amalia and Malachi hovered over the incubator, watching every movement, listening to each tiny pitiful peep, turning pleading eyes at me. Whimpering and groaning sympathetically. Asking me to bring food to them, as they couldn’t bear to leave. And water. And ice cream, since their spirits were so low. The poor chick inside the egg had already been abandoned and allowed to get cool. It was starting life out in a very disadvantaged position. Poor little thing! It needed our help. No chick was going to die inside an egg on our watch, if we could do anything about it! I decided to take the risk. I was pretty sure the chick would die inside the egg if I didn’t help it hatch, so I started peeling tiny pieces of shell away from the hole. Here you can see where I peeled the shell away. The rest of these eggs, by the way, were duds and didn’t hatch. Then I got nervous, and stopped. I got back on the computer. This time I found an article detailing how to help a chick hatch, step by step. What a relief! The relief was short-lived. The first rule: chip away at the shell, but leave the membrane intact! Never, never, never peel away the membrane!! (Gulp! Shoot. Doggonit. *sounds of my head hitting the wall, hard*) High humidity inside the shell is crucial to the chick being able to move around enough to hatch, and without the membrane mostly intact, the insides of the egg will dry out, the article asserted. I’d made this mistake already, so I took a washcloth and carefully dripped water inside the egg, being careful to avoid that sweet little beak moving around, praying for mercy and forgiveness at my rash, foolhardy, rule-breaking act. Then I chipped away more tiny pieces of the shell, in the same line that the chick might “zip” out of the shell, as the author of the article suggested. I left the rest of the membrane intact. Then I put the egg back into the warm incubator, added more water to the incubator, and waited. And waited. The chick continued to peep, weakly, but make no attempt to get out of its confinement. In fact, when I had peeled shell, I had hit a spot where the shell bled, so I knew I had to stop (thus saith The Article). Bedtime came and we all trudged off to bed, praying that the chick would hatch during the night. I knew that we’d wake up either to the live, fluffy, hatched chick, or the dead, still and cold, unhatched chick. I didn’t think it could last much longer in the egg. I could hear the chick peeping as I fell asleep. I woke up early, and felt sad before I realized why I felt sad. 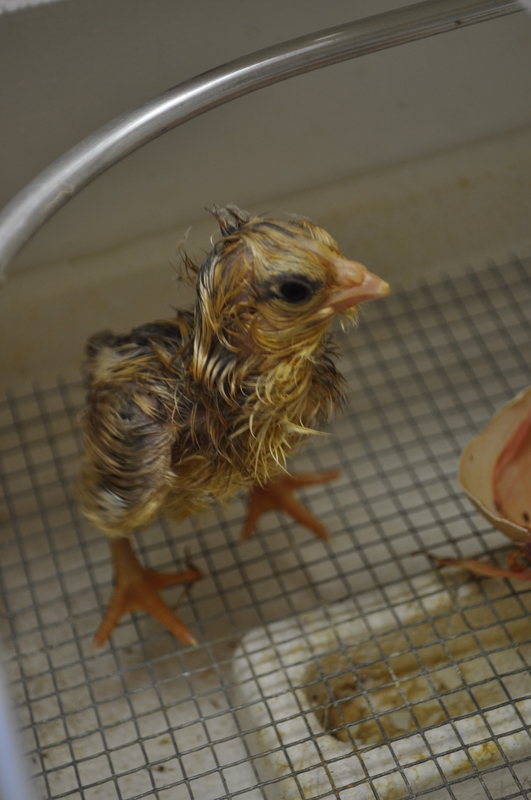 Then it came to me: I didn’t hear any peeping coming from the incubator. I got out of bed, my heart heavy, and walked to the incubator in the dark. 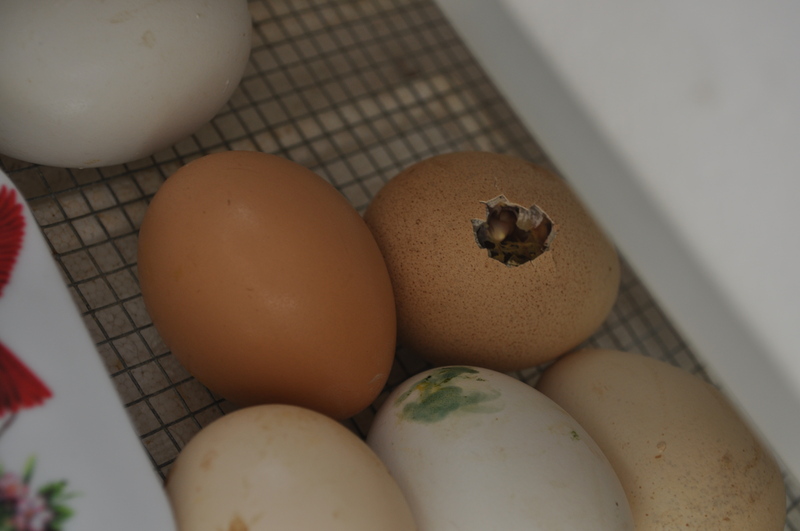 Then I heard it: “peep–peep–peep?”–and even better–some thrashing about in the incubator. The chick had hatched. Here’s a sight that only a mama could love . . .and look at that curlyness! Oh, did we celebrate that morning! We rejoiced and laughed and high-fived and generally made complete fools of ourselves in our happiness. The chick had hatched, and he seemed perfectly healthy! Now we just had to give him a day to get stronger and fluffier before we could introduce him to his new family. I decided that slipping him under Babes at bedtime would probably be the best way to avoid her rejecting him, or worse, actually attacking him. Babes is a sweet little mild-mannered hen, but chickens are unpredictable creatures, and I couldn’t assume that she’d tuck him under her fluffy self just because he was a chick about the same size as her other two. Now my college daughter is needing the computer–honestly! What’s more important, Bethie, your grades or my blog post? ?–yeah, I know, your grades–so I’ll have to tell you what happened when I introduced this last chick to his little family later this week. So until then . . . good day! Oh, you leave me hangin.